Early Bloomer. Shrub/vine, yellow-green flowers, white fruit, 3-lobed shiny leaves, reddish when young, mature leaves turn red in Fall. Notes: Sumac family. 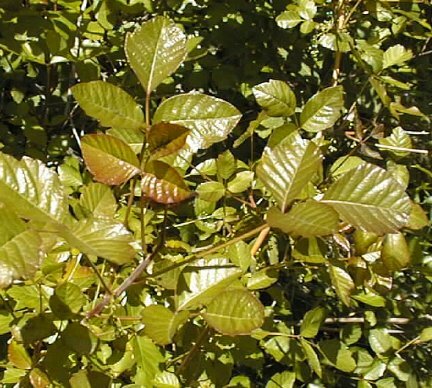 Poison Oak has a toxin that bonds to the skin within minutes, so if even hit by a branch, use a Wash-and-Wipe or alcohol to wipe the oil off your skin right away. On the walk, always ask if everyone knows what Poison Oak looks like, then use a specimen early on the trail to familiarize them with it. “Leaves of three, let it be” is only somewhat of a help, as many harmless plants fit that description. The flowers are whitish and young leaves are an ‘attractive’ shiny red color. It prefers shady areas and likes to insinuate itself among other plants. Always warn fellow hikers to look before they reach and touch! Native Americans may have built up an immunity to it by feeding small portions of leaves to their young. Full-blooded natives were immune; mixed blood were not. They used the young leaves to wrap around bread for baking and even mixed it into cornmeal for bread. They wrapped the bulbs of the Soap Plant with poison oak leaves for slow pit baking. Stems were used for baskets, juice from the stems, leaves and roots were used to cure warts and ringworm. As an aid for rattlesnake bites, fresh leaves were wrapped tightly around the wound. If done immediately, it is said to have counteracted the snake toxin. Poison Oak juice was also used for dye. Whenever you hike where Poison Oak lurks, it is good policy to wash any exposed skin as soon as possible thereafter. Smearing shaving cream on exposed skin prior to hiking provides a shield layer and enhances washing afterward. If all else fails, cures for Poison Oak include Soap Plant root, cooked and made into a paste, and strong extracts from the roots of Sunflowers.